Husqvarna Viking quality and features. 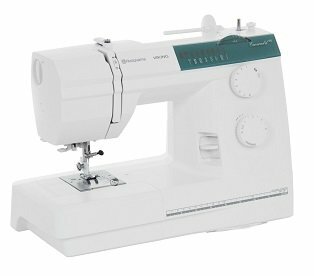 SEWING GUIDE REFERENCE CHART - Refer to your built-in Sewing Guide Reference Chart for recommendations on presser foot, stitch length, stitch width, thread tension, and presser foot pressure for your fabric type and sewing technique. BUILT-IN NEEDLE THREADER - Fast, easy threading. Utility stitches for sewing and mending, tri-motion stitches for knits and reinforcing, and decorative stitches for creative projects. ONE STEP BUTTONHOLE - Quick and easy buttonholes made with your one-step buttonhole foot. 8 PRESSER FEET – EMERALD 116 - Wide selection of presser feet included. SNAP ON AND OFF PRESSER FEET - Quickly change to recommended foot for perfect results. EASY STITCH SELECTION - Simply turn the dial to select your stitch. VARIABLE STITCH LENGTH AND WIDTH - Turn your dials to set stitch length from 0 to 4 mm, and stitch width from 0 to 5 mm. ADJUST NEEDLE POSITION - Position your needle for topstitching and quilting. INSTANT REVERSE - Tie off and mend easily. PRESSER FOOT LIFT - Fast and easy with extra lift for bulky projects. ADJUSTABLE PRESSER FOOT PRESSURE - Sew any fabric weight/type with perfect results. AUTOMATIC BOBBIN THREAD PICK-UP - No need to bring up bobbin thread manually. SWEDISH DESIGN - Convenient, easy sewing. METAL ONE PIECE CASTING - Strong, no vibrations. PERMANENTLY LUBRICATED, NO OIL NEEDED - No oil means no stains on fabric. 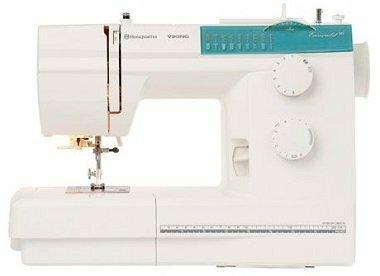 JAM PROOF FULL ROTARY HOOK - Smooth sewing with no hassles. TOP LOAD DROP-IN BOBBIN - Easy to place, easy to see. SLIM FREE ARM - Easy to sew on small projects. SLIDE ON ACCESSORY BOX - Convenient storage for all accessories. DROP FEED TEETH - Easy to lower feed teeth for button sewing and free-hand stippling and embroidery. CENTIMETER/INCH STITCH PLATE - Markings in centimeters and inches help guide your fabric while sewing. BUILT-IN RULER - Centimeter/Inch ruler on machine lets you measure ribbing and elastic at your fingertips. BUILT-IN HANDLE - Bring your Emerald to classes, or move it around in your home comfortably. LIGHT WEIGHT. APP. 16 POUNDS (8 KG) - Easy to carry and put away. HARD COVER - Protection, with pocket for User’s Guide. HORIZONTAL OR VERTICAL THREAD SPOOLS - Thread reels off freely from any type of spool. CLEAR BOBBIN COVER - Check bobbin thread supply easily. OPTIONAL PRESSER FEET - Choose between a wide range of Husqvarna Viking accessory feet for endless creativity presented in your Accessory User’s Guide.